All of us are thankful to God that he gave us these wonderful feet with which we can walk. You can walk and go to places. You can start your bright day by standing on these feet and feel grateful that you have the power to walk and control your destiny. When you go for an interview you just walk inside the interviewer's chamber and take your seat. When you need to walk away from a situation you just take your feet backward and leave the chaos. You enter the temple with these feet. You are in control of your destiny by these feet because you can decide where you want to go and places you want to avoid. You walk into a Satsang and feel grateful for listening to the talks of great Gurus. If you make a decision not to attend the event you can just walk off the place and leave. You walk your way to your favorite food stall, your favorite restaurant for dining and enjoy your food. You make a decision in your head and your feet carries the command. There would have been no “Ramayana” if Sita maa would not have walked across the line which Laxmanji had created for her safety. Such is the power of feet. It cuts it heals. It swells due to heavy work pressure caused by standing for long hours but it gets back to shape when you rest. You can go places, enjoy your holidays, shop throughout the day, wear your best footwear and feel refreshed. How do you define happiness or heaven? I would say when you are in full bliss you are in heaven because at that time you do not get distracted by anything. You just chill and enjoy life. You just enjoy the fun, the very experience at that time and feel on cloud 9. Your feet help you do that and enter heaven. You can wear your silver anklets and just forget it because it doesn't feel it is even there. Wear your heels and increase your height. I would say we all are so thankful that we have feet to walk, to stand, to run and do so many activities which we cannot do without them. Life is so much fun with our sweet feet. People say power lies in our hands. I say fun lies in our feet. You can run, do yoga and be in great shape because of them. When you go on your sacred journey and promise God that you will walk all your way to the temple so that your wish is fulfilled. You feel great because there is a feeling inside that God will fulfill your wish and give you what you want. 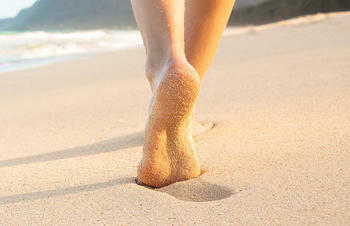 You walk on the sand and enjoy those summer holidays on the beach where life is so much fun. You cover your feet in the sand and make those small holes for playing. You walk on the beach where water splashes your feet and goes. You feel refreshed. You enter a state of bliss. You walk into your home, wash your feet to feel refreshed. You do prayer but before that, you wash your feet so that you are eligible to light your Diya and Agarbatti. I simply believe that our feet help us move to distant places and we can enter the small heaven of happiness in our lives with their help. Ever thought how your life would be without them. You would need the help of your family members just to move around and go places. Since you have your lovely feet you can walk around, wander and explore life by your own self without any help. You can climb the mountain and do siddhi by standing on one leg and concentrating just on God. Many Sadhus have climbed mountain top to attain God and they are still standing there by God’s grace. Your mind pulls you do something and it is your feet which prepares you to take that decision ahead. You earn your living by standing on your lovely foot if you are a speaker. You need to talk for hours and your feet helps you in doing that. Life is a blessing with our adorable feet. Walk your way to a wonderful life and create your own jubilant heaven.